Los Gauchos, the duck hunting professional outfitter is now offering Peru duck hunting and Peru hunting including a wide spectrum of waterfowl. Big game hunting is part of the Peru hunting menu with Los Gauchos Outfitters. There is no time like right now to go hunting in Peru. The Peruvian government and authorities welcome dove hunting in Peru as well as waterfowl trips such as duck hunting in Peru. You will not find the anti-hunting types here in a country that has a rich heritage of living off the land and celebrating the meals they receive for the Gods. 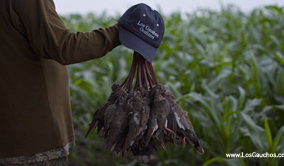 Although not as high volume as dove hunting in Argentina and Uruguay, Peru dove hunting is comparable to dove hunting to Mexico with respect to volume and quality. Peru dove hunting is combined with duck hunting in Peru. Steeped in tradition, Los Gauchos is dedicated to reproduce the North American waterfowl hunting experience in South America?sans the single digit limits, steel shot, and plugged guns. 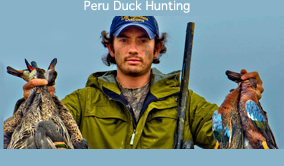 Peru duck hunting with a good variety of waterfowl. L os Gauchos, the duck hunting professional outfitter is now offering Peru duck hunting and Peru hunting including a wide spectrum of waterfowl. 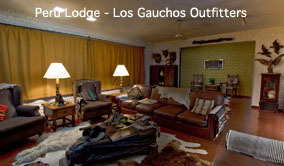 Big game hunting is part of the Peru hunting menu with Los Gauchos Outfitters. There is no time like right now to go hunting in Peru. The Peruvian government and authorities welcome dove hunting in Peru as well as waterfowl trips such as duck hunting in Peru. You will not find the anti - hunting types here in a country that has a rich heritage of living off the land and celebrating the meals they receive for the Gods. Duck hunting season in Peru stretches from March until November. However, our Peru Hunt Club (for ducks), called the Peruvian Duck Hunting Club with only offer duck hunting during the best times of the year: April - August. If you are interested in Peru Hunting, specifically waterfowl hunting in Peru, you will want to contact us for a complete information package. In addition to ducks and dove hunting in Peru, Andean goose hunting is also popular. This is a trophy hunt, and it is not high volume, but this is the type of hunting in Peru where one can walk away with a once in a lifetime trophy. Most goose hunters will harvest two or four geese per day. The goose hunting guides will ask you to shoot the birds in pairs of two. Wow. That could take up a whole website in itself. Peru, The Land of the Inca, is wild ... Wild and Wonderful. We imagine that it will stay that way for the rest of our lives, and our kids' lives. Peru hunting trips offer clients an opportunity to be truly enchanted by ancient cultures and artifacts. Rich histories. Beautiful and breathtaking landscapes. Indigenous traditions. These are all a part of what a trip to Peru is all about. Peru hunting vacations offer travelers a chance to see Lima's enormous tourist base. If ever there were a city more exciting for the tourist - it's Lima. The Miraflores district of Lima is full of great hotels, amazing restaurants, fine beaches for relaxing and surfing, and much more. Most importantly, Peru IS SAFE, in the big cities, and in the country - one should have no reservations whatsoever about Peru duck hunting. Gone are the days of the Shining Path insurgents. Ex-president Fujimori sent the military out to hunt them down and kill them all in the late 1990s, and he was very successful. Because Peru is now very safe, real estate values have tripled since the late 1990s, and the cities and countryside's are now bustling with peaceful commerce. The tourist zones of Miraflores and Mach Pichu are saturated with police, just to ensure that every tourist zone is completely secure. Guests of our Peru Hunt Club going to the country can expect a tranquil environment, and lands inhabited only by friendly ranchers, and peaceful Indians. So often, hunting has become so commercialized in some countries that it has taken the "wild" out of the adventure. Although hunting in Peru with Los Gauchos cannot be considered "roughing it" - not by any stretch, the Peruvian hunts still retain the "wild" factor. Once you get out of the cities, things are quite isolated. Africa is the only experience that could compare. The places we hunt are only inhabited by plants and animals, and people are very sparse. Because of this, we rely on a lot of specialized equipment to keep us safe and secure, as well as prepared to meet almost any unforeseen circumstance. This trip is a text book example of what "real hunting" is all about.